In early 2018 Janet began a series of talks on "How to Make a Meaningful Life." She is committed to the health and wholeness of her clients and client organizations. “Wholly unprepared, they embark upon the second half of life. Or, are there perhaps colleges for forty-year olds which prepare them for their coming life and its demands as the ordinary colleges introduce our young people to knowledge of the world? No, thoroughly unprepared we take the step into the afternoon of life; worse still, we take this step with the false assumption that our truth and ideals will serve us as hitherto. 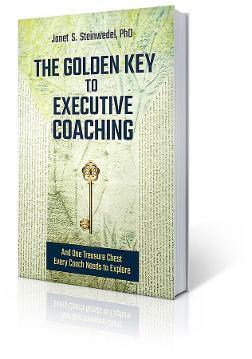 into a practical guide for being a successful coach. "gems of light" in the darkness of experiences, and knowing ourselves before supporting others. Her ability to see what is hidden in plain sight is profound. being an effective coach isn't just about skills, it's recognizing yourself as an instrument, a reflection of life experiences, appreciating the "wounded healer", not as an identity, but as part of the journey to effective coaching. Janet's work by far is a must read for those looking to be a successful part of the future of the profession. 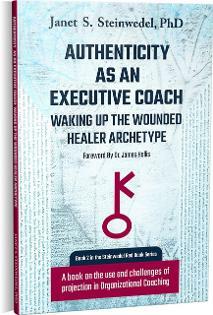 Authenticity as an Executive Coach is a compelling, substantive and enlightening narrative that should be an essential part of every coach's library." These characteristics provide a leader with the credibility necessary to get others to participate and enthusiastically contribute to the accomplishment of a common goal. The result: engagement, increased alignment and stronger organizations. Authenticity comes from knowing who you are, what you want, and what you're inspired to be. Most business people are so focused on the task at hand that they do not take time out to explore the questions that lead to greater authenticity. We facilitate this process with leaders, challenging them to stay connected to what's really important. We teach people how to reflect and connect: reflecting on past decisions and connecting those insights to future actions. This work brings integrity to the leaders we work with ensuring a clarity of message and style that allows them to lead most effectively. Because of the ever-changing landscape of today’s global business and the maturity and wisdom required to be successful in it, leaders at all levels must continuously learn new skills. This includes leaders in the boardroom, leaders of functions, leaders of teams, and leaders of projects. Leader’s Insight knows how to expand your organization's learning capability. ⤷ A spiraling outward to share with others what one has learned and to inquire about what one still needs to know. ⤷ It requires agility—a flexibility and nimbleness to adjust and try new ideas and approaches, to work with new people in new ways. ⤷ It takes a resilience that ensures each person can cope with the pressures, challenges and disappointments of living life at our edges. Resistance to change and defensive postures holds many capable leaders back from being their best. The life-long learner knows there is value in every experience. The agile leader is able to move forward despite unforeseen barriers. The added capability of resilience enables a leader to bounce back and maintain leadership. The nautilus shell is the perfect symbol for one’s journey of learning, living, finding new places within for greater strength and buoyancy, and gaining new understandings of who the Self is—making room for our growth and continuing that spiraling journey of insight our whole life long. Do the leaders of your organization have the skills necessary to win in today’s global marketplace? Enlist Leader's Insight to partner with you to empower leaders who can lead best in these uncertain times.